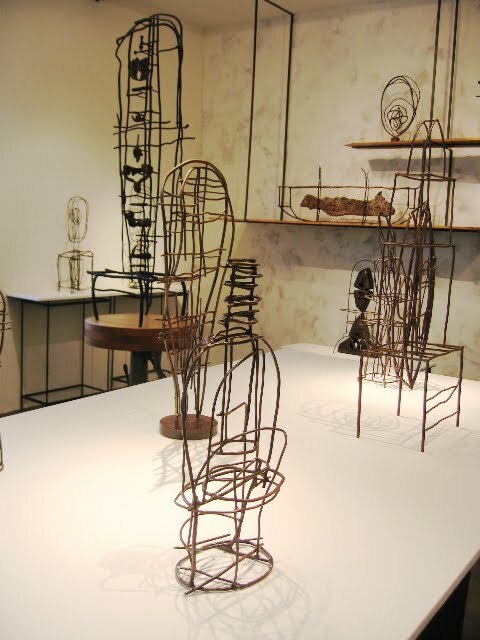 Since she began her art practice, Darcy Miro has covered an extensive territory with her metalwork. Her ability to adapt to various art markets is noteworthy, operating within the fields of fashion, design, art jewelry, and sculpture. Comfortable dwelling in the minute and the gigantic, her resume lists high profile projects such as her participation in the façade design of the American Folk Art Museum in 2001 with architects Tod Williams and Billie Tsien. Pierce and Stripe Cuff, 2011, oxidized silver, black diamonds, 2.5"x 3"x 2"
The collection showing at Shibumi Gallery consists primarily of pendants and cuffs with some earrings and rings interspersed. Their arrangement on a white exhibition table brings attention to the specimen like quality of the work and peering down at over 50 small abstract forms is not unlike a visit to the natural history museum. 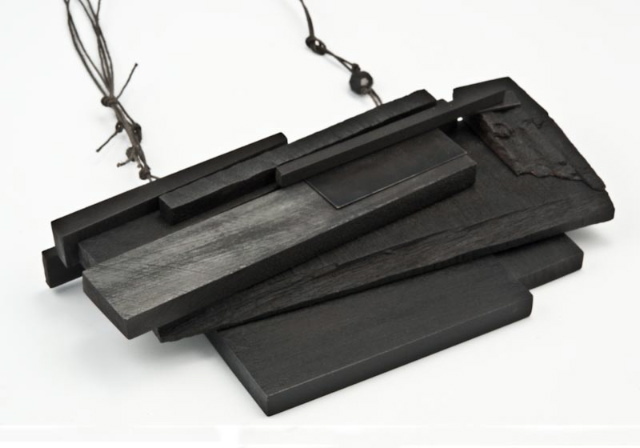 A slight break in continuum from her raw and imperfect aesthetic happens with the pendants strung on smooth black ribbon. Here the viewer is plainly reminded that these objects function as pieces of adornment. 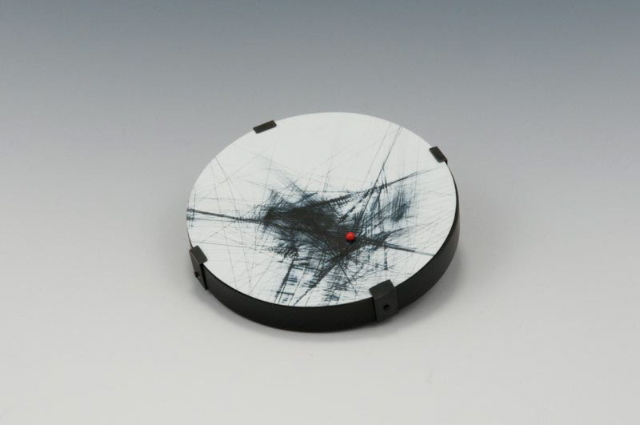 Medium Pendant Seven, 2011, oxidized silver, black ribbon, 1.75" x 3.25"
vWhile the work is a cohesive body of jewelry, Miro does not identify as a jeweler, preferring instead the broader title of metal sculptor. Balancing between the mark of nature and that of the maker, her forms are intuitively constructed, translated first into wax and then cast in sterling silver and 18k yellow gold. The majority of the pieces in the show, far from pristine and highly polished, are treated with a dark patina, leaving solder and scorched metal exposed. Short Stitch Cuff, 2011, oxidized silver, black diamonds, 2.5"x 3"x 2"
Her rich textures, referencing nature, architecture and the body, are a sultry marriage of the primordial and the high tech; what once was becomes tangled with what is. Each piece functions as a fleeting moment, a snapshot of the artist’s psyche as her conscious and unconscious observations of the day-to-day spill out onto the wax to eventually be made permanent in metal. Subtly sprinkled with black diamonds, the familiar sparkle acts as a sugarcoating as if to assure us that what we are looking at is beautiful. And it is. Wire Tie Ring, 2011, oxidized silver, black diamonds, 1" x 1" x 1"
Miro’s upcoming projects include installations at E.L. Butler in NYC, Art Basel in Miami and a large wall relief in Abu Dhabi. Ahna Adair is a jeweler, artist and writer based in Oakland, CA. To thank you for your patronage please take 20% off any one item during the month of January 2011! This offer excludes new commissions and may exclude rare diamond rings and some sculptures. Wishing you a Happy New Year filled with riches and subtle beauty! 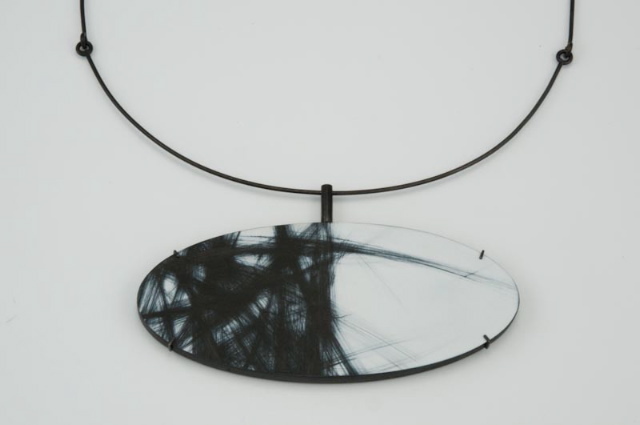 Our current show "Notation" JULIA TURNER features a new body of work focusing on Julia's jewelry and new wall pieces. The work is reminiscent of architectural landscapes and blurred images that reminded me of cityscapes, textiles, and scattered flying birds. 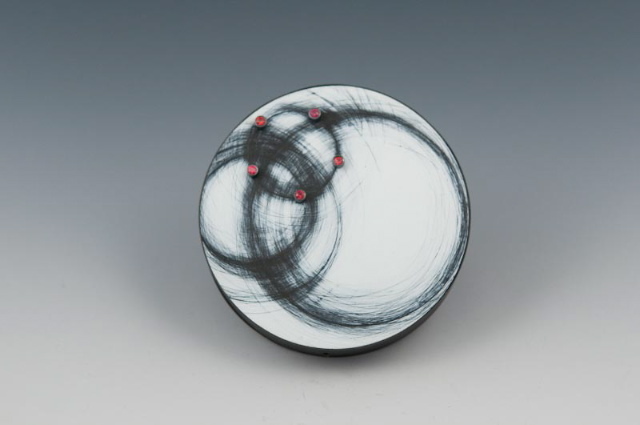 The work is black and white accented with a vibrant red; enamel, wood, glass, and red sapphires. Displayed on a cool gray table top in a considered fashion, the show invites you to view from a quiet place and ponder the imagery. The media is industrial white paint on patinated steel scratched away to form markings and later leaving abstract narrative impressions. As always, Julia's detailing of the work is thoughtful and her execution precise. Each piece is artfully thought out and even the backside including her clasps and attachments, is dealt with with the same kind of precision and care for detail. In 2004 Julia and I were exhibiting together at Collect which was hosted by the Victoria and Albert Museum. While walking around the Museum she shared her idea to scratch through white opaque surfaces. Now in this body of work the idea is fully realized. When Julia spoke at Shibumi I mentioned this and she laughed when recalling the unfolding of this process. Her process in making the pieces involves starting with a large sheet of steel, and scraping shapes and lines according to a feeling connected to the motion, rather than directly composing imagery. She then later scans the sheet for smaller sections which she extracts specifically for their impact when they are viewed within a small boundary. As a jeweler myself it is interesting that she has come up with these techniques to undermine her temptation to scrutinize and perfect everything. Julia Turner's work integrates a painterly quality which is one of the reasons why her pieces are so sought after by collectors. The fact she is transitioning into larger works that forgo the function of wearability seems like a natural progression. Her wall pieces, also on painted on steel, debut at this show. Along with the steel painted work Julia shows the wooden stacks with heavy sanding marks. Simple forms become dimensional landscapes and intentional compositional piles. The show is up through June 27th and we continue to show and represent her work year long. To see more of the work along with Julia's wall pieces please visit Shibumi Gallery or inquire for additional show images. An additional article on the Art Jewelry Forum blog by the artist can be seen here. 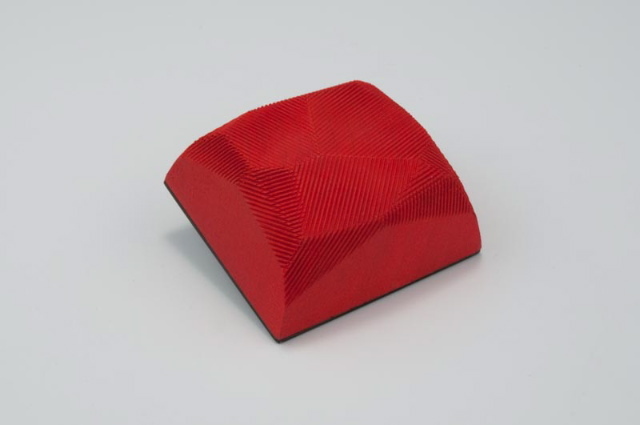 Our current show, Tina Rath / Jewelry has been extended through March 28, 2010. Tina is currently working on a large scale project Wanderlux: phase I, which premiered at the Institute for Contemporary Art in Portland, Maine in November 2009. And the grand finale: Waderlux: phase II will show with Sienna Gallery at SOFA NY in 2010. It will contain jewelry objects amongst the installation both in view and found in secret drawers. As long as I've known Tina her projects always come from a personal space. Her work challenges and expands the context of jewelry. This is reflected in the individual pieces as well as the unique contexts she creates to view them in. In Wanderlux she explores finding home, being strongly drawn to nature and being present in the moment. Tina has returned to California through a teaching sabbatical from Maine College of Art, to work on this intensive project. 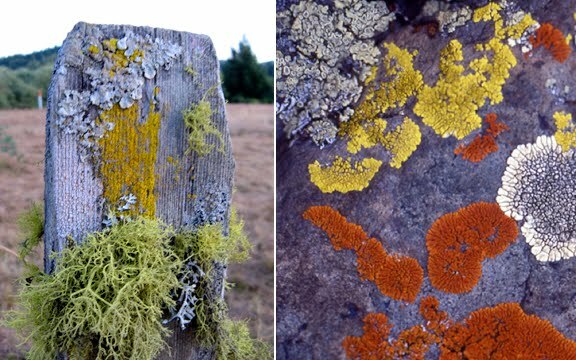 Her love for the outdoors and the beautiful forms of lichen, mushrooms and vastness of nature have enriched her life and play a central role in her current work. Shibumi Gallery is currently is featuring her her most wearable and elegant jewelry which is directly influenced by Wanderlux. Similar in feel from the larger scale project, the collector can buy a single brooch or wear them in multiples. 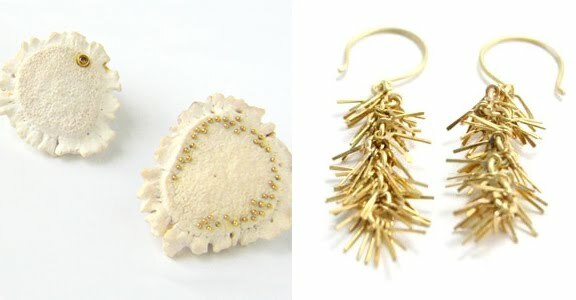 The forms are made of all natural materials; wood, ivory, fur, antler, gold, quartz and cognac diamonds. You can see a brief write up of the show on the Art Jewelry Forum website or better yet come see more of the work in person at Shibumi.